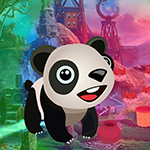 G4K Cute Baby Panda Escape is another point & click escape game developed by Games4King. There were a few houses in a beautiful and magnificent village. The place was beautiful to see. There was a cute baby panda living there. One day, that cute baby panda got unexpectedly stuck in a house. It is your duty to rescue the cute baby panda. It will help you to find the hidden clues in the form of colours and numbers and to find the items where the cute baby panda is to save the animal. Find them all and solve all puzzles to save the cute baby panda. Good luck and have fun! Played earlier, check all panels, cute game. There is a small paint brush on the place who needs yellow paint. where do the balls go and where to use 2112etc. clue?